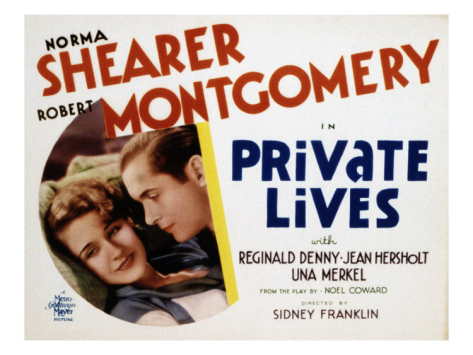 A recently divorced couple (Norma Shearer and Robert Montgomery) encounter each other while on honeymoon with their new spouses (Reginald Denny and Una Merkel), and decide to give their failed marriage another chance. Peary doesn’t review this pre-Code adaptation of Noel Coward’s best-known play (part of the “comedy of remarriage” subgenre) in his GFTFF, but he does nominate Norma Shearer as one of the Best Actresses of the Year in his Alternate Oscars — thus, I’m reviewing it as a potential Missing Title. However, despite positive reviews both at the time of its release (Mordaunt Hall of the New York Times referred to it as “a swift and witty picture”) and more recently (TV Guide writes that “the acting is excellent, and the result is charming”), I find it difficult to see the appeal of either the story or the characters. We know from the beginning that Montgomery and Shearer are one of “those couples” — and we all know at least one — who simultaneously adore and detest one another (see my recent review of Two For the Road for another example), and will remain together through giddy thick or acrimonious thin; but it’s our sorry luck as viewers to have to sit through their tiresome series of fights and make-ups. Clearly, fans of Coward and/or Shearer will want to search this one out, but it isn’t must-see for all film fanatics. No, though it’s worth a look simply for Shearer’s performance.